successfully but with little lower product yield. , oxone  or iodine . use in catalytic oxidation and acid anhydride synthesis. imidazole on polymer supported triphenylphosphine. acid with hydrogen peroxide . lose grafted with 4-vinyl pyridine . cellulose graft copolymerized with 4-vinyl pyridine i.e. 1-bromo heptane and aryl halide such as benzyl chloride. and the reagent has been evaluated and discussed. nitrate (CAN) in 120 min. at 45˚C. 30% H2O2 (S.D. Fine Chem. Ltd.) were used as received. to as Resin II, was collected and dried. products were separated by fractional distillation. 3.1 FTIR Spectroscopy Figure 1. FTIR spectrum of CellO-g-poly(4-VP)N-oxide. through two types of reactions. At lower temperatures i.e. CO2 and CO molecules with the formation of glucosan. The percent residue is 13.08%. 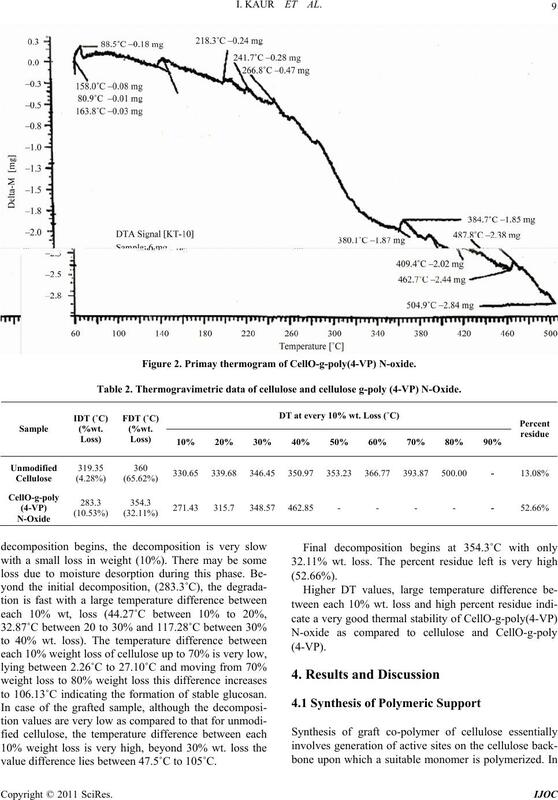 Thermal decomposition of grafted cellulose i.e. (4-VP) and CellO-g-poly(4-VP) N-oxide are compared. Table 1. FTIR spectroscopy of CellO-g-poly(4-VP). Figure 2. Primay thermogram of CellO-g-poly(4-VP) N-oxide. Table 2. 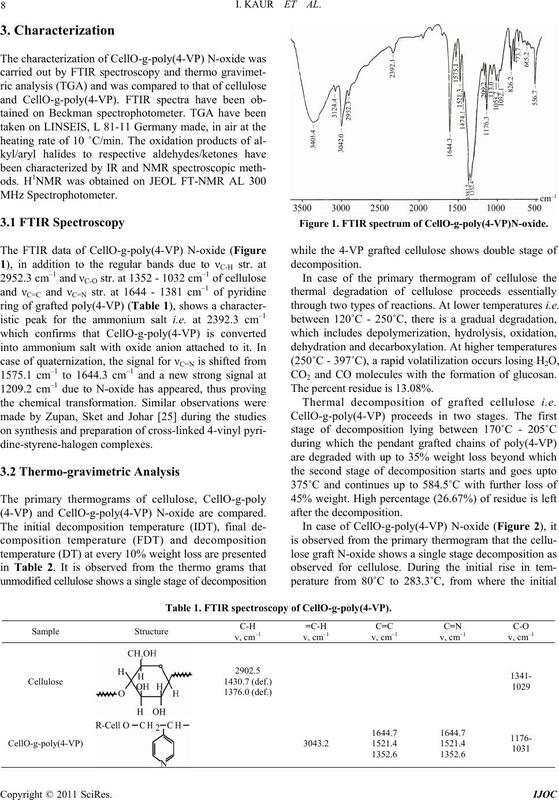 Thermogravimetric data of cellulose and cellulose g-poly (4-VP) N-Oxide. to 106.13˚C indicating the formation of stable glucosan. value difference lies between 47.5˚C to 105˚C. 10 I. KAUR ET AL. was used for the oxidation reactions. containing amine oxide group (I). mg, Solvent = 10 mL, Reactant = 5 mL). C-CHO skeletal structure are also observed. addition to the aromatic protons. protons (marked as a, b, c and d). triplet at 10.00 δ for aldehydic proton (d). Figure 3. FTIR spectrum of benzaldehyde. Figure 4. FTIR spectrum of 3-methyl butyraldehyde. attached to the carbonyl group. clear due to the overlapping of the peaks. Figure 5. H1 NMR spectrum of acetone. Figure 6. H1 NMR spectrum of heptanal. N-oxide as PS-oxidizing reagent has been achieved. and can also be easily regenerated for further oxidations. ganic Chemistry, Vol. 1, 1988, pp. 171-187. 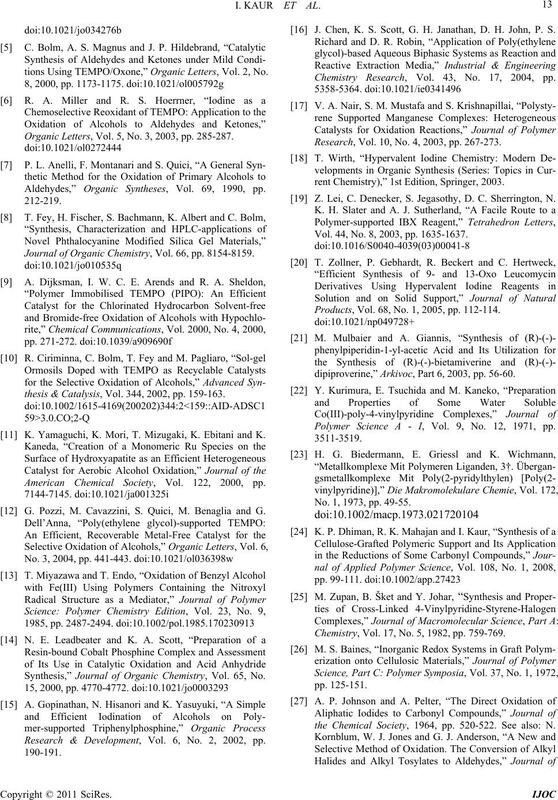 Journal of Organic Chemistry, Vol. 54, No. 12, 1989, pp. 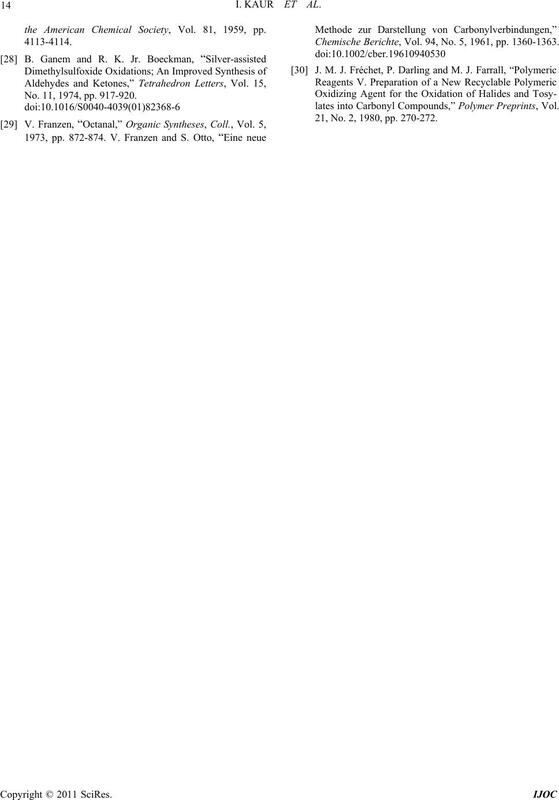 A. de Mico, R. Margarita, L. Parlanti, A. Vescovi and G.
of Organi Chemistry, Vol. 68, No. 12, 2003, pp. 4999-5001.
agent: (Resin II = 500 mg, Solvent = 10 mL, Reactant = 5 mL). tions Using TEMPO/Oxone,” Organic Letters, Vol. 2, No. Organic Letters, Vol. 5, No. 3, 2003, pp. 285-287. 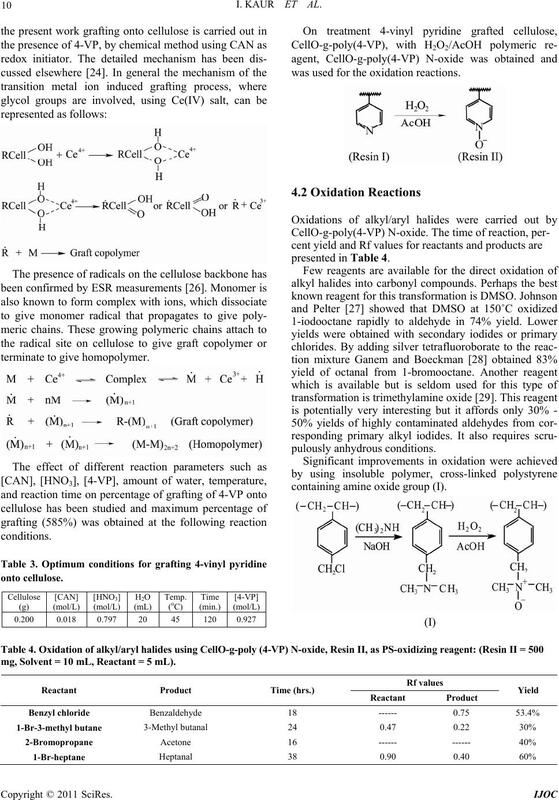 Aldehydes,” Organic Syntheses, Vol. 69, 1990, pp. Journal of Organic Chemistry, Vol. 66, pp. 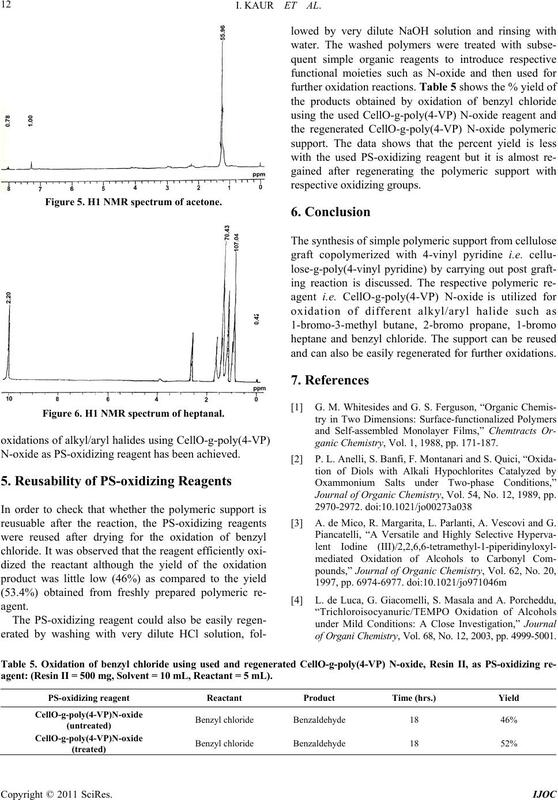 8154-8159.
thesis & Catalysis, Vol. 344, 2002, pp. 159-163. 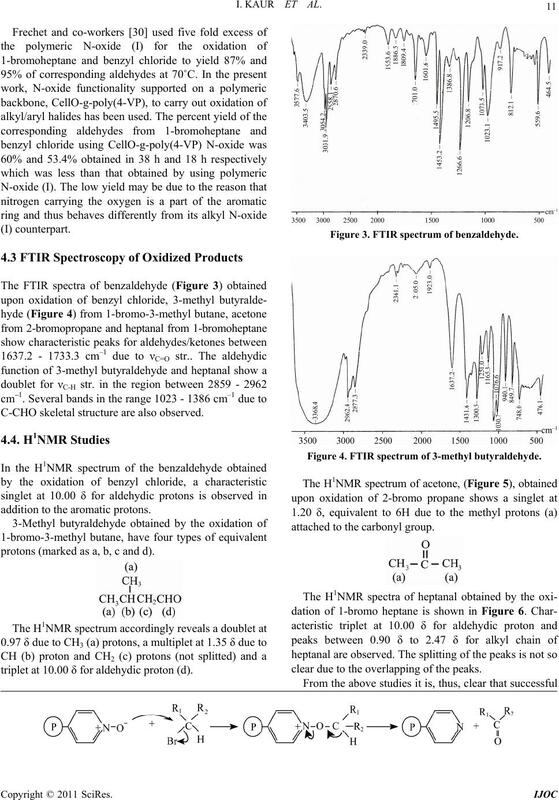 K. Yamaguchi, K. Mori, T. Mizugaki, K. Ebitani and K.
American Chemical Society, Vol. 122, 2000, pp.
. Pozzi, M. Cavazzini, S. Quici, M. Benaglia and G.
Synthesis,” Journal of Organic Chemistry, Vol. 65, No. Research & Development, Vol. 6, No. 2, 2002, pp. 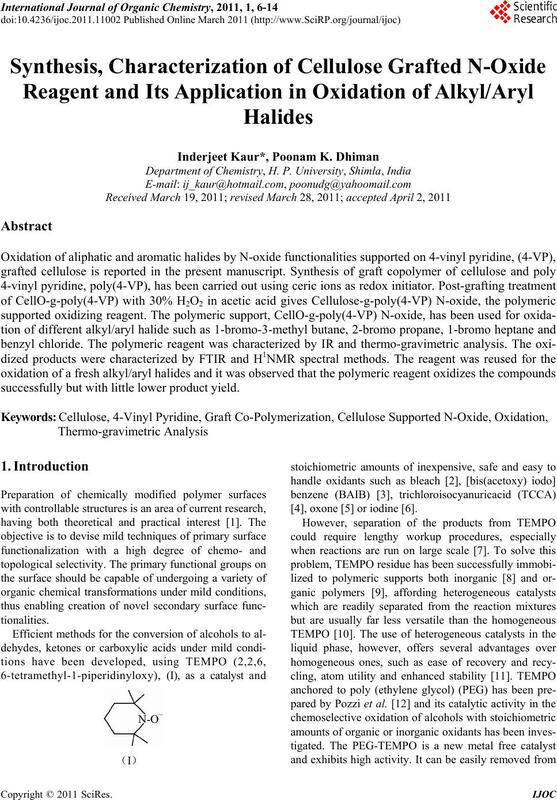 J. Chen, K. S. Scott, G. H. Janathan, D. H. John, P. S.
Chemistry Research, Vol. 43, No. 17, 2004, pp. Research, Vol. 10, No. 4, 2003, pp. 267-273.
rent Chemistry),” 1st Edition, Springer, 2003. Z. Lei, C. Denecker, S. Jegasothy, D. C. Sherrington, N.
Vol. 44, No. 8, 2003, pp. 1635-1637. Products, Vol. 68, No. 1, 2005, pp. 112-114.
dipiproverine,” Arkivoc, Part 6, 2003, pp. 56-60. Polymer Science A - I, Vol. 9, No. 12, 1971, pp. No. 1, 1973, pp. 49-55. Chemistry, Vol. 17, No. 5, 1982, pp. 759-769.
the Chemical Society, 1964, pp. 520-522. See also: N.
the American Chemical Society, Vol. 81, 1959, pp. No. 11, 1974, pp. 917-920. Chemische Berichte, Vol. 94, No. 5, 1961, pp. 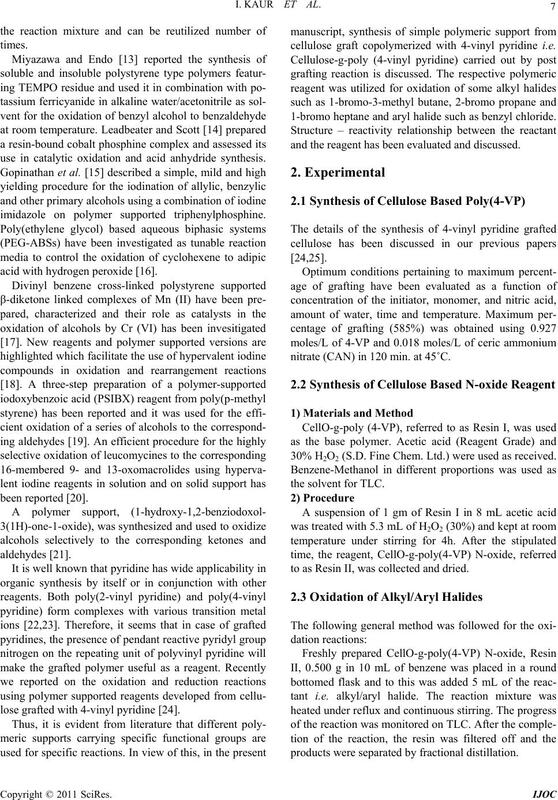 1360-1363.
lates into Carbonyl Compounds,” Polymer Preprints, Vol. 21, No. 2, 1980, pp. 270-272.